Posted on June 19, 2017 June 19, 2018 by Heather W.
Keep your house is clean is difficult enough in itself, especially if you lead a busy life and don’t have much time. Of course, you can always hire a professional cleaner from an agency such as https://www.maidthis.com/ to take care of this for you, but if you prefer doing it yourself, you could probably use a few tips on how to save time and be more efficient, especially if you’re blessed with the presence of a furry feline in your home. Aside from so much love and joy, they are known to bring just as much mess in your house. With them, the task of keeping your place clean becomes even more difficult. Just think of all that hair, sand, smells, all the things they love to throw over and around, and many more. Having all this in mind, here are a few tips which can help you keep your house in order, keep your nerves and keep your pet’s affection. Let’s start with the heavy hitter and the point of much contention for would-be cat owners. Yes, that would be the litter box. Besides the hair, this is the biggest source of mess and dirt, at least in our cat-owned apartment. It’s important to somehow “close” the litter box area, both because of the smell and because of the scattering of the sand. You can opt for a closed litter box, which looks like a tiny house and has a small swinging door, like on an actual door. If this is too expensive for you, or you simply have a functional litter box you still don’t want to replace, you can just put some cardboard around it. Even though it will not be as effective as the read deal, it can still help. Also, try to find the most neutral place for it, ideally in some rarely used corner or a spare room. Avoid putting it on the carpet if possible, or at least put some old towels underneath. It goes without saying that it should be cleaned daily, and washed with sand fully replaced once every two weeks, or as often as you feel (that is smell) that it should be replaced. All this will help you minimize the odor and keep the mess minimal and easy to clean. It would be ideal to brush the cat once a day, of course, if the master allows it. If you’re lucky enough, the cat will enjoy and gladly let you do it. In this way you’ll be able to collect most of the hair and throw it away, preventing it from being shed and spread all over the house. If, however, you live with this hardly approachable furry person who open despises and attacks the brush, like I do, well, good luck. In that case, learn to enjoy brushing your carpet, what else to tell you. Maybe you can try to appease the felinity with a special treat or distract them in some way so you would be granted the brushing permission. 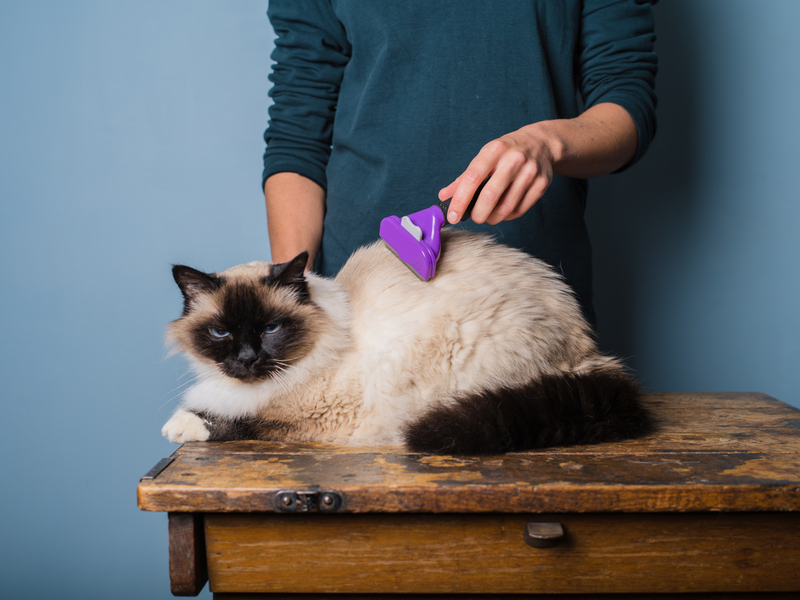 Except reducing the amount of hair shed around your place, it will also remove a lot of hair the cat would have otherwise ingested while self-grooming, so this can, in turn, reduce potential constipation and throw ups caused by the swallowed hair, which eventually means less mess to clean. Yes, I am aware that is the least favorite activity for you, and probably your feline friend as well. However, it is crucial for maintaining your house presentable. Vacuuming once a week should hopefully do the trick, but of course, you can do it more often if necessary. For better efficiency, you can get allergen filters which are more efficient at collecting the allergens, such as cat hair and dander. You can also get an aspirator for carpet cleaning, for smaller every-day interventions, so you don’t have to turn on your vacuum cleaner for a few particles of spilled litter or dry food. Vacuuming does require some time and effort, but doing it regularly really helps keep all the odors away, keep the air in your house clean and keep your carpet bright and clean. Eventually, if this is simply too much for you, consider getting rid of the carpet. Cleaning will become much simpler, plus there will be one thing less to absorb the dirt and odors, so this may be the final advice on how to make your life easier and your house cleaner. Having a pet in your house can be a lot of fun and they can provide a lot of emotional support, but they do require some hard work as well. Cleaning up after them is just one of those chores, but one most of us will gladly do in return for the companionship and the love we get from the little fur balls.